We are top of the league, said we are top of the league! Shizuoka had been wet pretty much all week, but praise the football Gods, at 11am this morning the clouds parted and a gorgeous sunny day was the reward for the 18000+ fans who rocked Nihondaira. They had a fast paced (for the most part) game to enjoy with plenty of shots peppering each goal, but the majority, myself included, went home kicking themselves. If we'd made more of our chances we're not only be top, we're be two points clear. Oh, well. I'm not complaining too much. 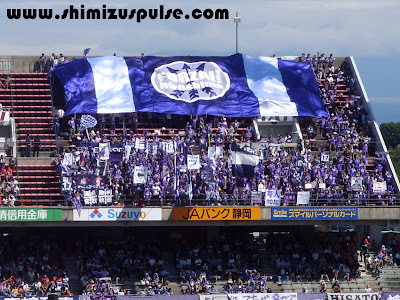 Hiroshima are good, and a hard team to play against. When they have hold of the ball they are not about to give it up easily. If it meant passing it back and forward across their back four till our players (and fans) started falling asleep, then that's what it meant. The moment we grew sick of this private kickabout and committed ourselves, the ball was hoofed 70 metres up the field to their number 14 or 10 who would instigate an attack. To be fair, this style worked, and we had trouble gaining control of the game for most of the first half. This was the major theme of the day's play, and it produced a goal for the visitors after half an hour. After the long ball upfield, a good, low cross was played deep into the six yard box and was met by Sato who put it away. Kaito was unlucky not to get down in time to block the shot and it squirmed under him into the back of the net. There was a hint of offside, but that was according to Iwashita, and it's not down to him, sadly. 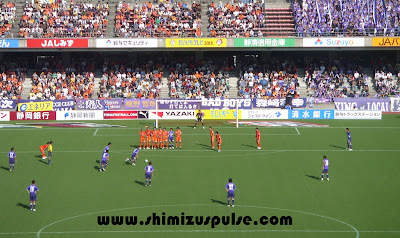 1-0 to the away team, but it's been nearly a decade and half since Hiroshima beat us at Nihondaira, so they must have known the game was far from over. Our equaliser came from hero, legend, and all round God-like striker Shinji Okazaki, who placed a header over the keeper and into the far corner with the type of skilled precision many players struggle to manage with their feet. Excellent finish. The second half was mostly ours, but we just couldn't breach their final line of defence. Johnsen went close when he beat the keeper to a cross, but a defender was on hand to clear it off the line. 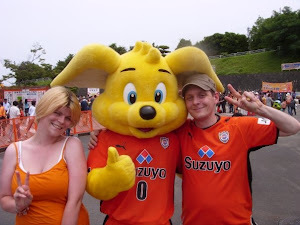 Next (after cup weekend) is Oita away in a fortnight. If we beat them they go down to J2 with five games remaining. Ouch. A kind of revenge for last year's Nabisco Cup, I guess, but we need to win it to maintain out title challenge and for no other reason. We're top, we're unbeaten in 13 and we have three players off with the national team this week. 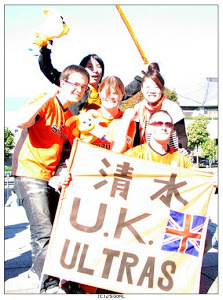 Things are pretty bloody bright for S-Pulse right now, but now let's get on with the final push to glory - three points in Kyushu, please! I had the pleasure of being at Nihondaira yesterday. Currently living in Gifu (and thus being an FC Gifu supporter for my sins) I try to go to a different J-League ground every week, a somewhat ad-hoc tour of Japan, and yesterday was your turn. I was sat in B Block, which I guess was just below where you were sat in the main stand. 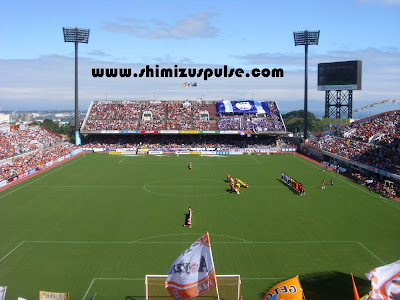 Nihondaira is such a nice stadium, a proper stadium if you will, in this world of executive boxes and premium seats etc. And the atmosphere.....sensational! A very Brazilian/South American flavour I thought. It looked like you needed a degree in performing arts/dance just to sit in the Kop! 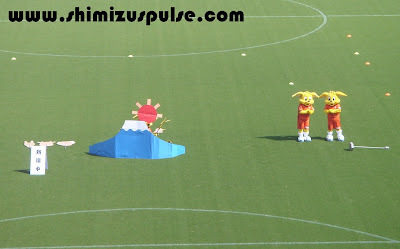 As for the game, Hiroshima were no mugs and looked pretty dangerous whenever Sato or Kashiwagi got the ball. Apart from his goal, I was really impressed with Okazaki's overall work rate, tracking back etc. The kid looks a gem. Anyway, good luck for the rest of the campaign!!! Hi and thanks for your comment. Yeah, as much as I was disappointed not to take all three points, it was not an easy game by any means, and Hiroshima were 4th in the table for a reason. Your tour of the country sounds excellent! I'd love to try something similar myself. Sometimes when S-Pulse are away in Kyushu or somewhere I do try and get to any random game I can, but it not always easy to find the time. Anyway, thanks again for your kind words. I feel we've drawn way to many games this year, so we need to pick up full points in our next couple of games to stay in the race. 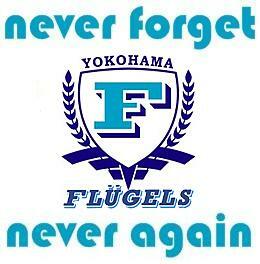 Away at Oita is certainly must-win!